Often times my photographs inspire mental revelations that I was not aware would occur in the heat of my shutter snap. It is during those times that I truly cherish the passion I have for capturing moments and things that, though visually captured, create the emotionally unknown. This is the reward. I was always fond of nature and throughout my childhood did my share of urban exploring in the South Florida suburb I grew up in. By that I mean my grade school best friend and I used to dig whatever we could out of the mud behind her house, the Boca Ratonesque urban version of a boggy creek, and throw it on a slide under her microscope. Frogs were the best. Sadly, we drifted through middle school when she found cheerleading and I found competitive team sports...and boys and cigarettes. We still keep in touch. My urban exploring continued In middle school where my version of nature may have been sneaking cigarettes in the woods by the canal on our walk to school or just sneaking a smoke in the parking lot of my mom's apartment building - just as she is pulling up - I'll let you deduce how that played out. Let's just say when you blow smoke through the neck of your shirt - it doesn't stay in there. I digress. Regardless of where I was exploring and how much I loved it, I've always loved photographing my adventures. Mostly, it is how I can remember strangely intimate details of sometimes unimportant things, like the time, when I was 10 I found $40 in a gas station parking lot. I remember everything about that day becuase of the photo of me in the kitchen next to the dishwasher that had to be rolled over to the sink when it had to be run. The hideous half shirt and charm necklace combo with earrings to big for my head that belonged to my then Aunt Sue. I thought she was so cool becuase she had feathered hair and big earrings. I was adamant someone photograph this as selfies weren't yet a known occurrence. 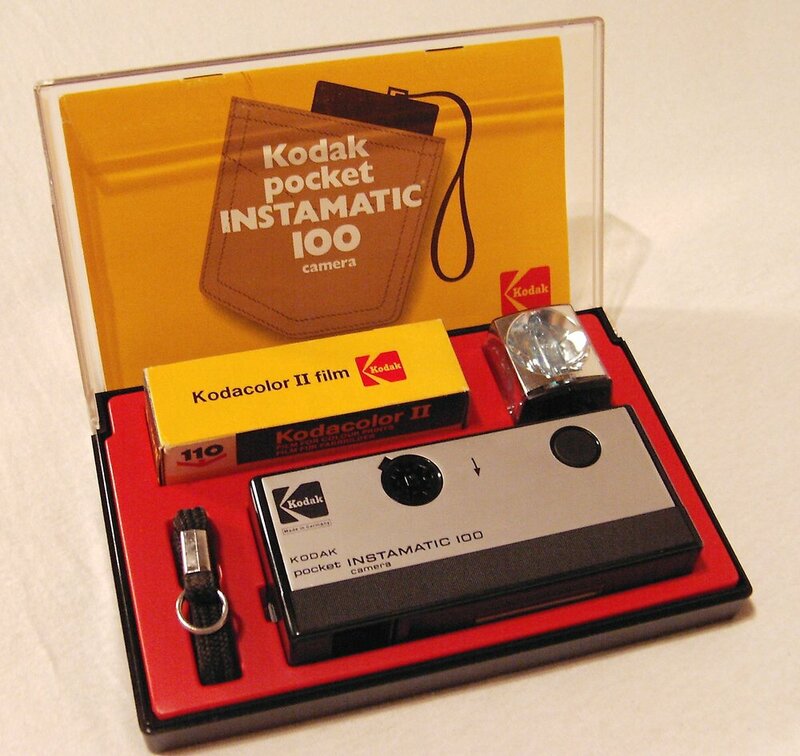 I couldn't wait to have the film developed from my Kodak Disc 4000, my Instamatic 100 or was it a disposeable? Now that, I cannot remember. Sadly, I rarely slow down to shoot...so often times, I don't get to revel in all of the detail then and there. Sometimes, it is even months before I really have time to look at and digest the depth of some of the images I have created. I suppose that is how it was meant to happen becuase if anyone took the real time necessary to take in everything around them - we'd all be at a standstill. Wait, maybe that isn't a bad idea. As I was working on my website, I found myself lost in thought about this photo of a tree. This was a shot I snapped on a quick roadside stop on the way from Knoxville to Gatlinburg a couple of years ago. My girlfriend and I were on a week long adventure through Tennessee and Alabama in search of some mountain experience, a visit with my estranged biological father and a cabin stay with her parents. The trip was adventurous to say the least. Maybe I'll share more with you one day about that. Look at the heart - the tiny sprouts of grass living amongst the dead - the years of life that that tree endured before a chainsaw found it's trunk. 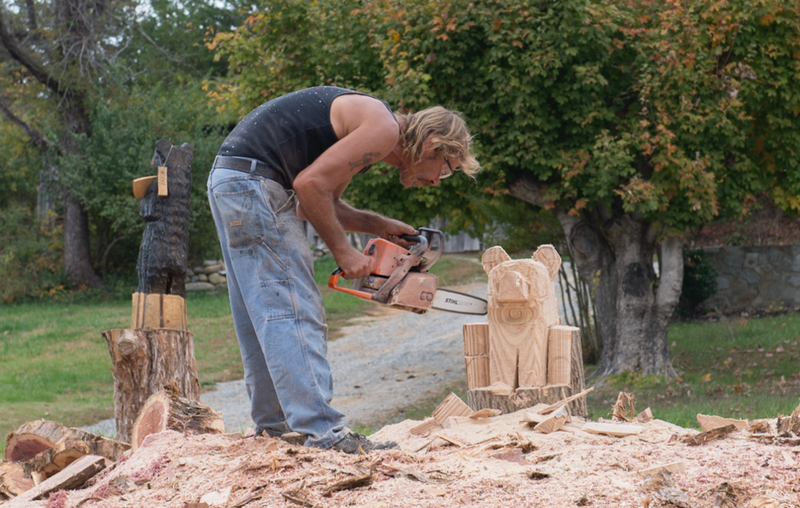 These trees have seen and will see more in their lives than some of us humans ever will and though they are laying on the ground in what some would see as a firewood pile, they were being carved into incredible works of art. 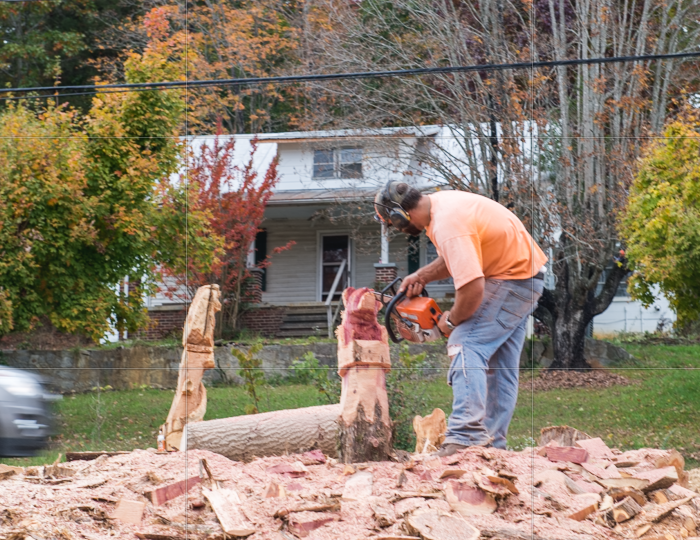 These lumberjacks were using well orchestrated and seemingly flawless moves with giant chainsaws to give these trees new life. I'll always be a thinker...maybe that is why I am such a bad listener.